a recently purchased feeder, the other is to refurbish a very old one. Break out your work clothes and lets get to it. Why does a feeder age? being inside or under a protective roof or even a feeder hanging under an eave of a house. Many of us think it's the rain or moisture that damages wood and this is good thinking. attacking the wood's cellular structure at an even deeper level. we find the wood's outer layer becomes gray or grayish and will have a cracked or checked appearance. whole board begins to crack, typically from the board's ends. sun will eventually evaporate these materials from the wood's surface and the process noted above begins. Let's fix this problem so you can enjoy your beautiful feeders for decades. Lets start with the easy one. The newer feeder. every twelve months or so. If you wish to have some fun and take this all the way. Follow me. 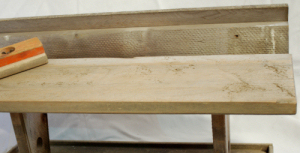 To truly refinish this feeder, it will take a little more elbow grease and more time. we ask you to use a good screwdriver with good bite to take the screws out. Once the roof is off, clean and wash everything. Allow it to completely dry before starting the next step. 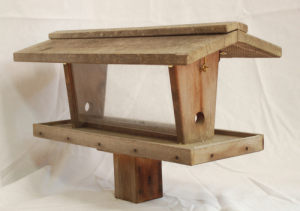 Once the feeder is dry, scrape any remaining loose material that is fixed to the base. scratch marks. 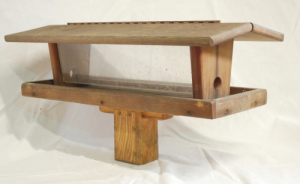 As best you can, sand the feeder's graying areas down to fresh wood. them removing the finish quickly. Sand these out very well. effort in sanding out the roof. Remove as much of the old wood and strive to get down to fresh lumber. a long way in keeping the boards from prematurely cracking over the upcoming years. Fully Transparent Penetrating Oil Finish or Deck Stain. has received 10 coats of paint in its life. Even with a fresh coat of paint, it looks rough and ugly. remember, refinished wood ALWAYS comes out a LOT darker than the sample in the store. the finish in a well ventilated area. Here at Hurley-Byrd we have a whole room designed specifically for submersing our products into the finish. The room stands alone, is power ventilated and all electrical components in and around the room are explosion proof pieces of equipment. Some finishes are extremely volatile and all are positively harmful to your health. TAKE ALL PRECAUTIONS TO PROTECT YOURSELF, OTHERS, PETS AND YOUR BELONINGS. Follow the manufacture's instructions exactly. Revisited 14 Months Later - How's it doing? Click here or the photo to see a supersized version. lessons my father taught me had something to do with "the proof being in the pudding", as dad said. His saying was, "Be like an old farmer son, prove it me and I'll believe." Dad was right (don't tell him I said that) and I've adhered to that saying most of my life. Here at Hurley-Byrd we do things one way. a few years, the pores in the wood open due to the natural aging process and when the refinish coat of penetrating oil is applied, it penetrates much deeper than new lumber can possibly allow. a quick coat of new finish, especially on the roof. At that time it will have its screws tightened, etc... If this feeder is maintained in this fashion, there is no reason it will not last 15 to 20 years and yours will too. Click here or on the photo to see a large picture. the wood on this feeder will begin to deteriorate very soon. 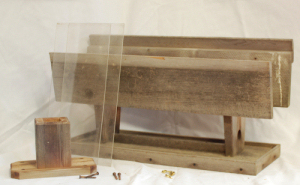 wipe a new coat of penetrating oil finish on the whole feeder. Once the finish is completely dry, it's time to reassemble the feeder. Before installing the roof, clean the Plexiglas hopper panels. We use windshield washing fluid here but any good window cleaner listed for acrylic sheeting will work perfectly. When you reinstall the roof screws, only run them in until snug. 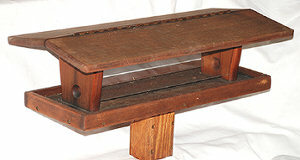 A feeder with a little age on it will have slightly deteriorated screw holes. Although they still have excellent holding power, the holes can be stripped fairly easily. Just run them in snug and you will be good to go. Once complete, reattach the removed accessories and reinstall in your favorite feeding location. You have now competed a job well done and have extended the life of your feeder for many years. We have found a refinished feeder accepts the penetrating oil much more deeply that new lumber and you too will find the next refinishing will be several years away. Click here or on the photo to supersize. Now for someting a little more challenging. The OLD dried up feeder. Once the sanding is complete, apply the finish as noted above in the Titmouse refinishing instructions. (Click here to be taken to these instructions) Apply the finish prior to reassembling the feeder. receive a significantly better protective coat of finish. stuff a little sawdust in the screw hole and this will help secure it in place. of the accomplishment and so will your wildlife. Not to mention stretching your wildlife feeding dollars. Better yet, you can expand your feeding station with a new feeder instead of just replacing an old one. Write us if you have any questions or comments. Here is the result proving a little effort brings great rewards. This feeder actually looks better than it did new! really do produce the best of the best in the world... and getting better all the time! how to refurbish feeders in extremely poor condition. finishes in 2004 and continue to this day. 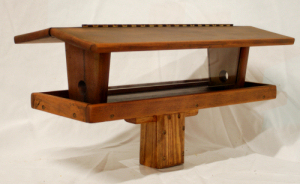 The lumber used in this feeder was a very rare and very pink piece of cedar lumber making a beautiful statement. The second photo shows this feeder after eight years. detailed picture. You will see the ends of the boards are cracked and overall the feeder is in rough condition. 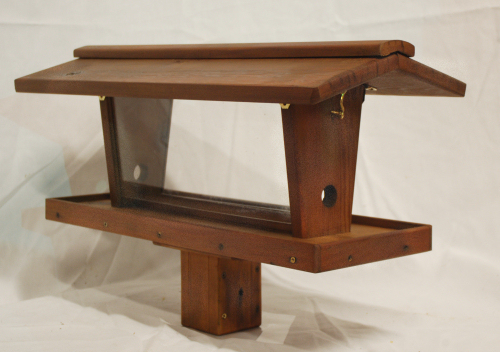 This feeder needs a complete refurbishing so the whole feeder was disassembled, sanded and finish applied. it needed to have all the gray wood removed. Begin by disassembling the feeder. You won't be able to do this with a manufactured feeder due to their use of staples but since Hurley-Byrd feeders are assembled with solid screws, they can be taken apart and reassemble later. will not line up properly or at all. the old soft wood needs to be removed. using this feeder for another ten years. also achieve the same great results. feeder above refinished 14 months earlier. It has spent the entire time in the blazing sun at one of the most active feeding locations of my own home.